Fletcher is a graduate of the University of Tasmania from the class of 2015. He is aspiring to be an ophthalmologist. During his free time, he flies as a private pilot. Penny joined the University of Tasmania and the Launceston Eye Institute after completing a PhD at University College London. Penny’s background is in epidemiological research and evaluations of health services and health care interventions. In her spare time, Penny rescues and cares for neglected and abandoned ponies. A/Prof Brendan Vote is a Clinical Associate professor in Ophthalmology at the University of Tasmania and a consultant ophthalmologist. He graduated from the University of Queensland. He established the Tasmanian Eye Institute that is devoted to research, education and service in ophthalmology. He has published more than 80 peer reviewed articles. A/Prof Vote is an avid squash player and skier, as well as keen follower of cricket. Introduction: This study compares visual outcomes between patients undergoing a single surgery combining cataract and epiretinal membrane (ERM) peel versus cataract surgery preceding ERM surgery as separate procedures. Materials and Methods: A retrospective review was undertaken of electronic medical records for patients undergoing ERM surgery by vitrectomy, performed by a single surgeon. Peri-operative, three month, and twelve month follow-up visual data were collected. Three groups were identified: 1) Cataract surgery prior to ERM peel; 2) Combined ERM and cataract surgery; and 3) Cataract surgery post-ERM peel. Post-operative complications and mean change in visual acuity (VA) were investigated in the cataract surgery prior to ERM group compared to the combined surgery group. Results: A total of 271 eyes underwent ERM peel either before or after cataract surgery, or combined with cataract surgery. 62 eyes were excluded as they did not have follow-up data available. 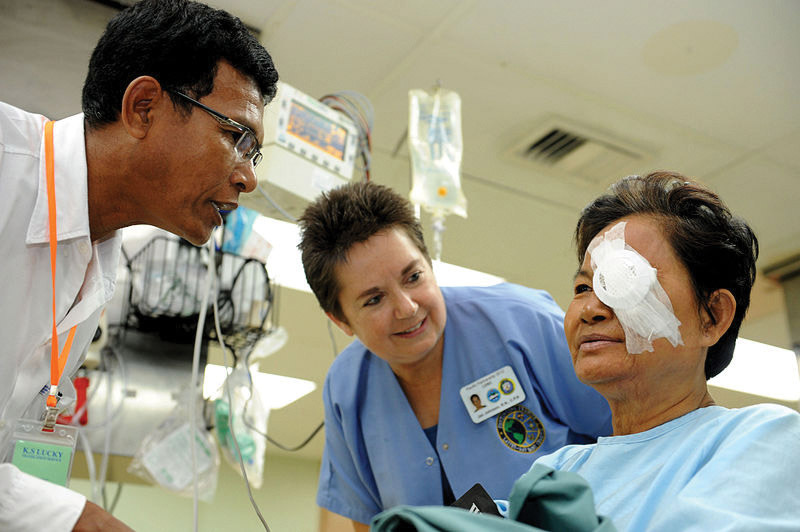 Of the 209 included eyes, 62 had cataract surgery prior to ERM peel, 105 had combined ERM peel and cataract surgery, and 28 had cataract surgery post-ERM peel. 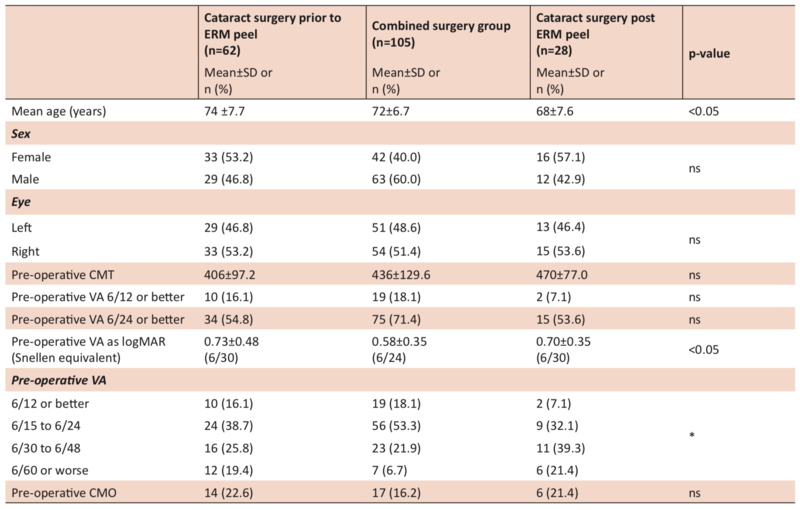 Analysis of outcomes in the cataract surgery pre-ERM versus combined surgery group found improvements in both groups’ VA at three months (mean logMAR (logarithm of minimum angle of resolution) improvement -0.10 vs. -0.08, p=0.87) and twelve months post-operative follow-up (mean -0.18 vs. -0.22 p=0.54), with no significant difference between the groups. There was no difference in the proportion of eyes in either group that had peri-operative (9.5% vs. 4.8%, p=0.28) or post-operative complications (5.9% vs.1.8%, p=0.42). Conclusion: Combined cataract and ERM vitrectomy is as effective as consecutive operations for improving VA, whilst reducing patient exposure to the risks associated with two separate procedures. The epiretinal membrane (ERM), also referred to as macular pucker or cellophane maculopathy, is a sheet of fibrous cells on the surface of the retina. Proliferation of the fibrous cells and the subsequent contraction of the membrane lead to defective visual symptoms, in particular distortion and blurred vision. ERM is a relatively common occurrence with ageing, with the prevalence of ERM ranging from 8.6% to 12.1% amongst various ethnic groups and countries [1-3], and typically affecting patients over 60 years old . Often symptoms are only minimal and ERM requires no intervention unless progression occurs. In some instances however, ERM adversely affects vision and requires treatment through surgical intervention with vitrectomy and an ERM peel procedure. Patients requiring treatment for ERM may have other comorbid eye conditions, such as cataract, which also need to be addressed. Therefore, the question arises if these two problems are best addressed simultaneously or sequentially. The current literature provides only small case series in answering this question and results have been mixed, although most papers have found no significant differences [5-7]. There is also a paucity of literature that compares combined surgery and cataract surgery prior to ERM peel. In this study, we sought to identify the number of patients who underwent ERM vitrectomy before or after cataract surgery and the number of patients who received ERM phacovitrectomy combined with cataract surgery at a single site. Secondly, we sought to determine complication rates and visual outcomes in patients who had combined ERM cataract surgery compared to cataract surgery prior to or after ERM vitrectomy. Following approval from the University of Tasmania Human Research Ethics Committee (H0015009), we conducted a retrospective review of the medical records of patients who were diagnosed with ERM and underwent an ERM peel vitrectomy by a single surgeon. 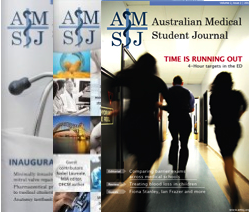 The surgeries were conducted in an Australian regional town (Launceston) between July 1, 2005 and May 12, 2014. Inclusion criteria were patients with pre-operative visual data and twelve month post-surgery follow-up visual data. Patients were classified according to the date of cataract surgery in relation to their ERM vitrectomy: cataract surgery before ERM vitrectomy, combined phacovitrectomy, or cataract surgery after ERM vitrectomy. Patients who did not return for twelve month follow-up were excluded. Snellen acuity measurement of best-corrected visual acuity (BCVA) was performed and the results were converted into a logarithm of the minimal angle of resolution (logMAR) before analysis. To utilise a stable BCVA, the twelve month post-operative follow-up BCVA was used in the final analysis. The surgeries were performed by one surgeon. Details on posterior vitreous detachment (PVD) and peri-operative complications were also collected. Data from patient records were extracted into an Excel 2010 (Microsoft, Redmond, WA, USA) spreadsheet and imported into Stata 14.1 (StataCorp, College Station, TX, USA) for analysis. Continuous data distributions were investigated and one-way analyses of variance (ANOVA) were used to investigate baseline differences between the three groups (cataract surgery pre-ERM, combined, or cataract surgery post-ERM) with Tukey-Kramer post-hoc tests. For categorical data, crosstabs with Chi-square and Fisher’s exact tests were utilised to investigate differences among the three groups at baseline. These were also used to investigate complications and the proportion of eyes with VA improvements of one chart line or greater at three month and twelve month follow-ups for the cataract surgery pre-ERM group versus the combined surgery group. Independent t-tests were used for the investigation of mean change in VA (logMAR) and mean change in CMT from baseline to three month follow-up, and twelve month follow-up between the pre-ERM group versus the combined surgery group. All tests were two-sided and differences were accepted as significant at p<0.05. A total of 271 eyes underwent ERM peel either before or after cataract surgery, or combined with cataract surgery. There were 62 eyes excluded as they did not have follow-up data available. Twelve month follow-up data was available for 209 eyes from 199 patients (93 women and 106 men) and these were selected for analysis. There were 108 (51.7%) right eyes and 101 (48.3%) left eyes (Table 1). There were 62 (29.7%) eyes with cataract surgery prior to ERM peel, 28 (13.4%) eyes proceeding to cataract surgery post-ERM peel, 105 (50.2%) eyes with combined ERM peel and cataract surgery, and 14 (6.7%) eyes with solely ERM peel that have not yet required cataract surgery (Table 1). Table 1. Baseline characteristics of all eyes. There was no significant difference between the groups for pre-operative CMT or cystoid macular oedema (CMO). There was a significant difference in mean age between the groups (F2,192=7.8, p=0.001) with the Tukey-Kramer post-hoc test indicating a significant difference between the cataract surgery prior to ERM peel group and the cataract surgery post-ERM peel group (p<0.0001) and the combined group and the post-ERM peel group (p=0.02), but not between the cataract surgery prior to ERM peel group and the combined group (p=0.13). 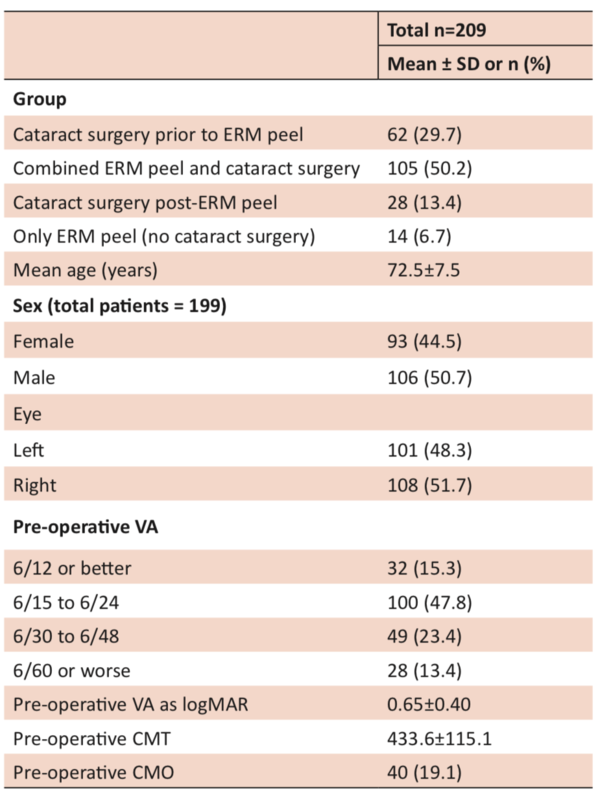 The combined surgery group had better mean VA (logMAR) pre-operatively compared to the cataract surgery prior to ERM or post-ERM groups (p=0.04). In the cataract surgery pre-ERM group, there was a mean of 1347±1179 days between cataract surgery and ERM peel. Table 2. Baseline characteristics of cataract surgery pre-ERM, combined surgery and cataract surgery post-ERM groups. *Unable to calculate due to small expected cell sizes. ns: not significant. Overall there were 18 peri-operative complications: 17 retinal tears or breaks (8.1%) and one lens touch (0.48%) There was no difference in the proportion of eyes that had peri-operative complications in the cataract surgery pre-ERM group compared to the combined group (4.8% vs. 9.5%, p=0.38) or in the proportion of eyes with postoperative complications (1.8% vs. 5.9%, p=0.42). In the post-operative period, CMO developed in five eyes that had combined surgery and three eyes that had cataract surgery after ERM peel. No eyes that had cataract surgery pre-ERM developed CMO post-operatively (Table 3). Comparing the cataract surgery after ERM peel versus combined surgery group, there was a trend for a larger proportion of eyes receiving cataract surgery after ERM to have CMO post-operatively, although this was not statistically significant (11.1% vs. 4.8%, p=0.36). 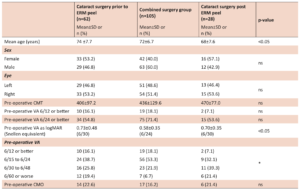 There were improvements in both the cataract surgery pre-ERM group and the combined group at three month and twelve month post-operative follow-up appointments (Table 3). There was no difference between the groups for mean change in VA (logMAR) from baseline to three month (p=0.87) or twelve month follow-ups (p=0.54). There was also no significant difference in mean change in CMT from baseline to three month follow-up (p=0.07) or twelve month follow-up (p=0.20) between the groups. Table 3. Visual acuity at three month and twelve month follow-up in pre-ERM versus combined surgery group. *Note: Five pre-ERM eyes and ten combined eyes did not have three month follow-up data available. †Three eyes with missing twelve month follow-up VA excluded. ‡There were 41 eyes with twelve month follow-up PVD information not available. BCVA is our main tool for predicting visual outcomes in ERM vitrectomy. It is a widely used and reliable prognostic factor to measure visual outcomes . Our study utilised results from a single vitreoretinal surgeon and one centre, which provided consistency for this study, and reduced variation. We investigated outcomes in the combined surgery and the cataract surgery prior to ERM peel groups, due to the limited published research comparing these groups. For these outcome analyses, we excluded the cataract surgery post-ERM group. Dawson et al  found pre-operative VA may predict visual improvements at follow-up. Our results confirm Dawson et al’s  research for both groups, with the strongest prediction being for the consecutive surgery group (pre-surgery VA is a stronger predictor of follow-up VA in consecutive versus combined surgery). In our study, the combined surgery group had better mean (logMAR) pre-operative BCVA, due to a greater proportion of eyes within the 6/15 to 6/24 range. To control for greater baseline visual acuity in the combined group, we analysed change in BCVA (logMAR) at follow-up between the two groups. Our finding of no significant difference in mean VA improvement between the cataract surgery pre-ERM group and the combined group is similar to previous research. In a 2010 study by Dugas et al , 174 eyes were compared for surgical outcomes between combined and consecutive cataract extraction and ERM vitrectomy. At twelve months follow-up, the groups did not demonstrate a statistically significant difference in VA improvements . In another similar study conducted by Yiu et al  in 2013, 81 eyes from 79 patients were grouped into combined cataract and ERM vitrectomy and ERM vitrectomy alone. Yiu et al  found no statistically significant differences between the groups on VA improvements at six month and twelve month follow-up. We also found no significant difference in mean improvement in CMT between the cataract surgery pre-ERM group and the combined group. This finding is also consistent with both Dugas et al  and Yiu et al . Eyes that had cataract surgery after ERM peel had approximately double the incidence of post-operative CMO compared to the combined surgery group. While this finding was not statistically significant, this may be explained by the small number of eyes that developed CMO in each group, resulting in a lack of power to detect a significant difference between the groups. Among the combined group in our study, 5.0% developed CMO. This concurs with previous studies that reported incidences of 3.6% to 8.1% in combined surgical cases [7,8]. A separate study also concluded no difference in the incidence of CMO between combined surgery and pre-ERM groups . 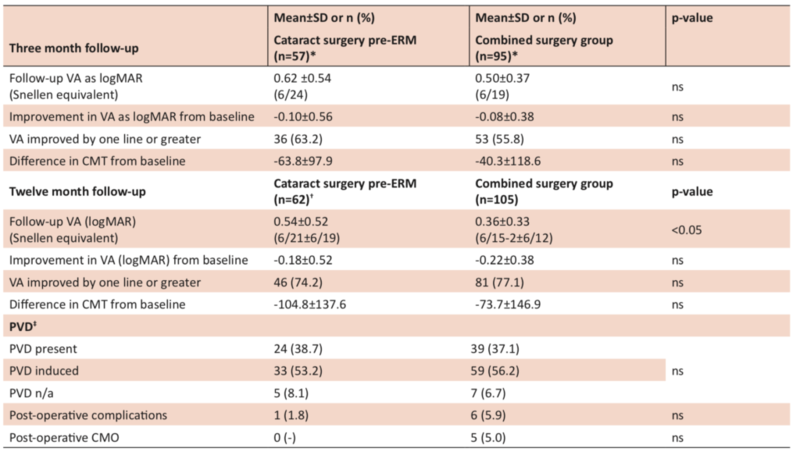 Due to the small sample size, and no eyes in the cataract surgery pre-ERM group developing CMO post-operatively, we were unable to determine if the incidence of CMO would have improved if consecutive surgery (either cataract surgery before or after ERM peel) was conducted. Perhaps a further study with larger population sizes would allow for a clearer understanding of this. ERM peel is known to be a safe and effective procedure. Our study indicated that there was no statistically significant difference in the proportion of patients in the combined or sequential groups who had peri-operative or post-operative complications. Peri-operative complications included retinal tears and lens touch. Post-operative complications included CMO and posterior capsule opacification. The rate of complications we observed was also consistent with similar studies. As such, we would conclude that there was no evidence to demonstrate that combined surgery would be safer in terms of complications. The benefits of a combined operation include the reduced risks of two separate operations, reduced costs, and increased convenience for the patient. Furthermore, a cataract operation after an ERM peel might be more challenging for the surgeon, due to the lack of vitreous support and increased difficulty of intraocular lens placement, thus increasing peri-operative complications . Both ERM and cataract affect vision, so conducting a cataract operation alone might not provide optimal VA improvement, as there may be progression of ERM. Considerations against combined surgery include an increased post-operative inflammatory response, CMO, and increased rates of posterior capsule opacification and posterior synaechiae formation . Limitations of this study include its retrospective design. Unfortunately, this was necessary to identify a substantial number of patients for inclusion (this required an eight year study inclusion period), as the study recruited patients from the only cataract and vitreoretinal surgeon in the region. A prospective study including patients from several surgeons would have less bias and the results would have greater generalisability. We excluded patients from the study if they did not return for post-surgery follow-up. This resulted in 29 combined surgery eyes and 33 pre-ERM eyes being excluded. If these eyes were included in the study, 21.6% of the combined surgery group and 34.7% of the pre-ERM would have been categorised as lost to follow-up. It is probable that patients lost to follow-up may have had better improvements in their VA. However, it is unknown to what extent the exclusion of these eyes may have introduced bias to the study results, particularly when comparing the two groups. The patients who underwent combined phacovitrectomy had a better mean (logMAR) VA and a greater proportion had a pre-operative VA of 6/24 or better. Given the presence of both pathologies, these patients underwent combined surgical procedures. However, some of these patients with both pathologies (ERM and cataract) may have had an acceptable VA improvement from cataract surgery alone, such that they would not have ordinarily proceeded to epiretinal surgery. In contrast, the patients in the cataract surgery prior to ERM peel group had already selected themselves into that group requiring ERM surgery as they were sufficiently affected by ERM. Thus, the patients in the consecutive surgery group potentially would not present for surgery unless already having a worse pre-operative VA than the combined surgery cohort. We acknowledge that an analysis of a twelve month follow-up BCVA would include various confounders, such as new ophthalmic pathologies or worsening of pre-existing pathologies. Those factors were not taken into account during our analysis. As post-operative conditions tend to stabilise by three months following operation, we also analysed our patients at the three month follow-up period. The results were similar at three and twelve month follow-up intervals. Whilst we made an assumption that the patients were stable at three months, they appeared to continue improving after this time, as demonstrated by the twelve month follow-up results. Additionally, our comparison did not include patients who were diagnosed with ERM but only underwent cataract surgery, as they might not present for ERM peel secondary to acceptable visual improvements. Our consecutive group involved patients who underwent cataract operation then ERM peel. Some of these patients might have developed ERM only after the cataract surgery. Finally, our study is limited by the absence of baseline comorbidity data. As such, we were unable to assess the impact, if any, of comorbidities on VA improvements. This study has shown that combined cataract and ERM vitrectomy is at least as effective as consecutive operations, if not better, for improving VA. As such, it may be prudent to conduct combined surgery, as it reduces patient exposure to the risks of two separate operations, as well as being more convenient for the patient. We would like to thank the staff at the Launceston Eye Institute for their technical assistance in obtaining the dataset required for this research. Cheung N, Tan S, Lee S, Cheung G, Tan G, Kumar N, et al. Prevalence and risk factors for epiretinal membrane: the Singapore epidemiology of eye disease study. Br J Ophthalmol. 2017;101:371-6. Noda Y, Yamazaki S, Kawano M, Goto Y, Otsuka S, Ogura Y. Prevalence of epiretinal membrane using optical coherence tomography. Nippon Ganka Gakkai Zasshi. 2016;119(7):445-50. Aung K, Makeyeva G, Adams M, Chong E, Busija L, Giles G, et al. The prevalence and risk factors of epiretinal membranes. Retina. 2013;33(5):1026-34. Kauffmann Y, Ramel JC, Lefebvre A, Isaico R, De Lazzer A, Bonnabel A, et al. Preoperative prognostic factors and predictive score in patients operated on for combined cataract and idiopathic epiretinal membrane. Am J Ophthalmol. 2015;160(1):185-92. Dugas B, Ouled-Moussa R, Lafontaine PO, Guillaubey A, Berrod JP, Hubert I, et al. Idiopathic epiretinal macular membrane and cataract extraction: combined versus consecutive surgery. Am J Ophthalmol. 2010;149(2):302-6. Yiu G, Marra KV, Wagley S, Krishnan S, Sandhu H, Kovacs K, et al. Surgical outcomes after epiretinal membrane peeling combined with cataract surgery. Br J Ophthalmol. 2013;97(9):1197-201. Kim KN, Lee HJ, Heo DW, Jo YJ, Kim JY. Combined cataract extraction and vitrectomy for macula-sparing retinal detachment: visual outcomes and complications. Korean J Ophthalmol. 2015;29(3):147-54. Wensheng L, Wu R, Wang X, Xu M, Sun G, Sun C. Clinical complications of combined phacoemulsification and vitrectomy for eyes with coexisting cataract and vitreoretinal diseases. Eur J Ophthalmol. 2009;19(1):37-45. Savastano A, Savastano MC, Barca F, Petrarchini F, Mariotti C, Rizzo S. Combining cataract surgery with 25-gauge high-speed pars plana vitrectomy: results from a retrospective study. Ophthalmology. 2014;121(1):299-304. Dawson SR, Shunmugam M, Williamson TH. Visual acuity outcomes following surgery for idiopathic epiretinal membrane: an analysis of data from 2001 to 2011. Eye (Lond). 2014;28(2):219-24. Cole CJ, Charteris DG. Cataract extraction after retinal detachment repair by vitrectomy: visual outcome and complications. Eye (Lond). 2009;23(6):1377-81. Smith M, Raman SV, Pappas G, Simcock P, Ling R, Shaw S. Phacovitrectomy for primary retinal detachment repair in presbyopes. Retina. 2007;27:462-7.